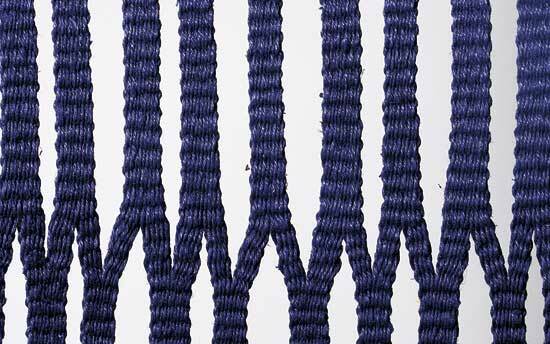 Contemporary textile artists’ work is often rich in references to other cultures. Traditional techniques are used to generate new forms; images and themes from other cultures are re-envisioned and contemporized. 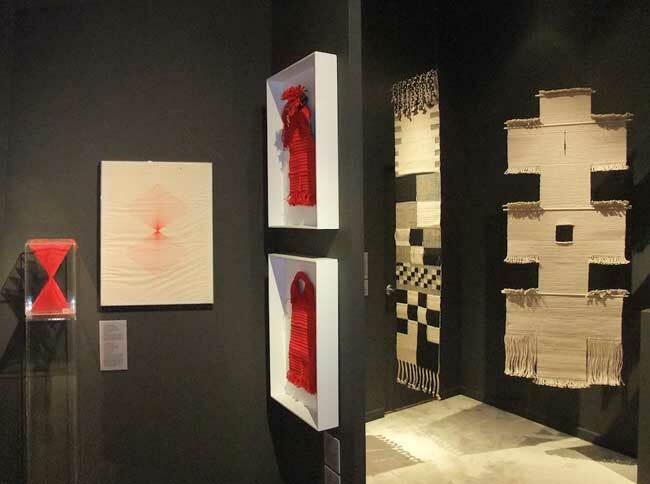 Through her study of Peruvian gauze weavings, Lenore Tawney discovered a reed that she was able to adapt to create the innovative slits and openings that characterized her work. Nancy Moore Bess’s baskets are informed by her travels to Japan, most recently re-interpretations of the jakago/snake baskets used in Asia to bind stones at the edge of a river or lake to prevent soil erosion; and Jin-Sook So reinvents Korean pojagi by creating patchworks of gold-plated steel mesh instead of the traditional scraps of ramie and hemp. Is there a point at which cultural “borrowing” stops being an acceptable compliment and becomes unacceptable co-option? That’s the criticism being made of Russian figure-skaters Oksana Domnina and Maxim Shabalin, whose multicultural ice-dancing theme, based on aboriginal costumes, music and dance, have drawn the ire of Australian Aboriginal activists. On January 28, 2010 in the Wall Street Journal, Eric Felten reviewed the Olympic controversy, similar arguments made about white musicians having no right to play jazz, and recent cross-cultural creations by the likes of Paul Simon and Vampire Weekend. In “On Thin Ice: Two Russians Skate off the Reservation,” Felten cites T.S. Eliot as endorsing artistic appropriation, quoting him as saying, “bad poets deface what they take, and good poets make it into something better, or at least something different.” Felten argues that it is too much to expect “cultural interlopers” to make something better; it should be enough that the borrowing “makes for something different”. And sometimes that something different will be more than different. It will be art. 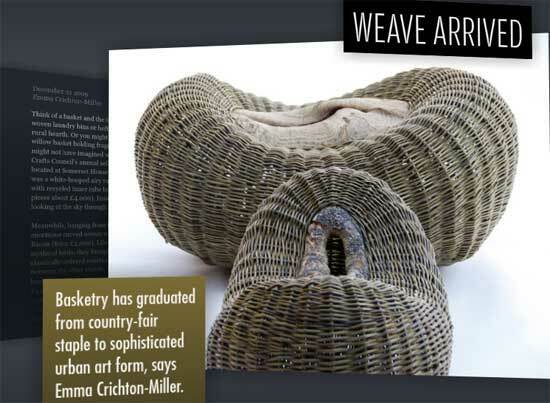 Basketry has graduated from country-fair staple to sophisticated urban art form, Emma Crichton-Miller wrote in Weave Arrived, an article in the December 5, 2009 issue of the Financial TImes‘ glossy weekly magazine, how to spend it. Over the last 15 years, Crichton-Miller observes, “basket-making has experienced not just a revival but a reinvention.” The transformation to an expressive medium has been led in the UK by Mary Butcher, recently designer-in-residence at the Victoria and Albert Museum. Butcher learned traditional skills from artisan basketmaker, Alwyne Hawkins, but as a research fellow she began to use the materials to create work that “slipped its leash” — cones that hang from the ceiling, chains of bark rings and densely woven sculptural shapes. Crichton-Miller notes that outside the UK, art basketmaking has had a high profile for sometime as a result of artists like Markku Kosonen of Finland, and John McQueen and Ed Rossbach in the US. From February 3rd to the 8th. browngrotta arts will join more than 80 international galleries exhibiting at the American International Fine Art Fair (AIFAF) in Palm Beach, Florida. 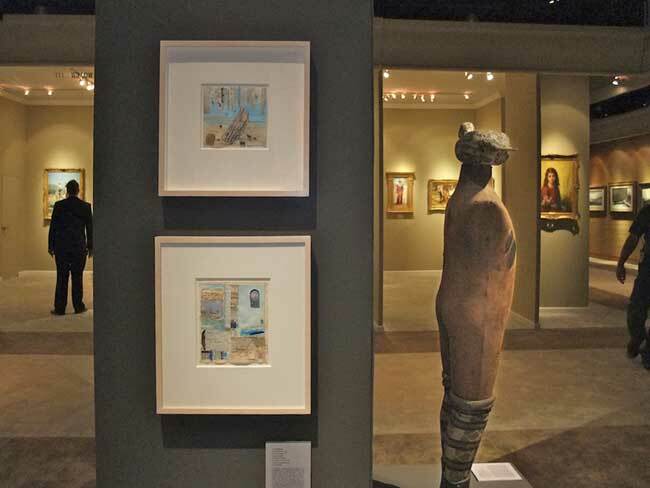 AIFAF is recognized as the “crown jewel” of American art fairs and is the only American art and antiques fair rated 5 stars by The Art Newspaper. AIFAF is a fully vetted fair, featuring prestigious international dealers presenting a mix of paintings, sculpture, jewelry, antiques, contemporary design and decorative arts. 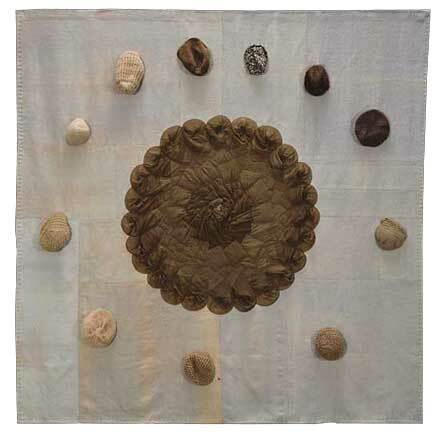 In cooperation with the Baruch Foundation and the Lenore G. Tawney Foundation, browngrotta arts will feature the work of Magdalena Abakanowicz and Lenore Tawney at AIFAF, artists whose work redefined weaving and sculpture in the 20th Century. Weavings by Magdalena Abakanowicz at AIFAF. The weavings on the far right and far left were woven in the 1980s; the piece in the center is from the 1960s. 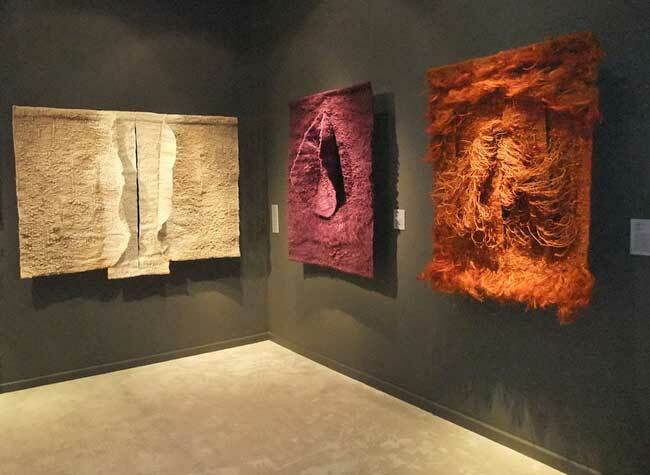 At AIFAF, browngrotta arts will exhibit three weavings by Abakanowicz, one from the 1960s and two, from the Anne and Jacques Baruch Collection, Ltd., created in the 1980s. The Baruchs opened a gallery in Chicago in the late 1960s, bringing work to the U. S. from Central Europe in order to give exposure to the Slavic art that Jacques, who died in 1986, once described as “the finest work of tomorrow…not what is known…the new blood.” Jacques was unable to travel after 1970, but Anne continued to travel to Central Europe to search for art. As the political situation in the area tightened, Anne, began smuggling art into the US, often at great risk. Government agents would seal her packages of approved art before she left; with the help of artists, she would often unseal the packages and reseal them in order to add unsanctioned works. She would travel with a bright red Hartman suitcase with a false bottom, filled with art supplies that the artists could not buy. On her return trip, artworks would be hidden inside. In this manner, Anne amassed a singular collection of contemporary textiles and historical and contemporary Czech photography. The Baruch Foundation was established in 2008, subsequent to Anne’s death in 2006 and is comprised of her personal art collection and the artwork inventory of The Anne and Jacques Baruch Collection, Ltd. The missions of the Foundation are to preserve and foster the growth of the visual arts of Eastern and Central Europe through donations of artwork to museums and schools, and to fund educational programs and scholarships by the sale of artwork. Works by Lenore Tawney on display in the browngrotta arts booth at AIFAF. 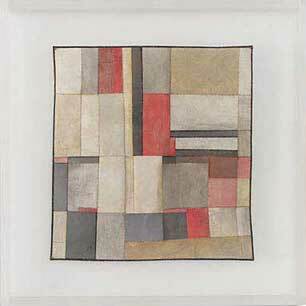 At AIFAF, browngrotta arts will also show weavings, drawings, collages and mixed media assemblages by Lenore Tawney, who died in 2007 at the age of 100. “Luminous is an apt word to describe the entire career of the American artist Lenore Tawney,” wrote Holland Cotter in the New York Times in 2004. In the 1950’s, he noted, “she created a series of monumental open-weave sculptures that were like nothing seen before or since. Astonishing.” About her collages Cotter has written, “Whether she sets cut-up bits of handwriting spinning around a reproduction of a Michelangelo sibyl or turns strips of antique German books into suspended grids, she touches on the roots of the collage medium in language and personal history with a reticent orginality.” The Lenore G Tawney Foundation was established in 1989 by Tawney for charitable and educational purposes. Its aim is to support other artists in their own artistic efforts and to support special projects at art museums and non-profit educational arts organizations; its highest priority is to nurture emerging artists and to provide them with learning opportunities through established educational programs.